Lincolnshire is rich in architectural antiquities, and one of the most striking of the domestic class is Harlaxton Manor-house, situated in a remote corner of the beautiful village of Harlaxton, about three miles from Grantham. The mansion is said to have been originally built by John of Gaunt. Portions of the structure are in so dilapidated a condition, that it is almost considered dangerous to examine them. The entrance-hall contains some portraits, chiefly of the Gregory family, who have possessed the estate for ages past. In the noble rooms are various articles of olden furniture, armour flags, and a stone coffin, found in the neighbourhood some years since. Many curiosities have been dug up in the grounds—particularly an urn, containing burnt bones and coins; and a helmet set with jewels, now in the Cabinet at Madrid. The house contains some splendid paintings. Several of the windows are filled with painted glass; and there is a curious tapestry-room. A few yards from the hall, in what appears formerly to have been the park, are two stones, embedded in the earth, twenty­-one feet apart, with the date 1623 on one of them, marking the place and extent of an extraordinary leap by one of the domestics, which he performed, it is said, for a wager, and which caused his death a few days afterwards. A great portion of the ancient building is covered with luxuriant foliage; and the crumbling structure seems, in places, almost held together by thick ivy and clustering trees. The estate is the property of Gregory Gregory, Esq., who has been building near his ancient family seat a princely mansion, which has occupied nearly twenty years, and, it is said, has cost the proprietor from £8000 to £10,000 a year. The new mansion—which we have engraved, from a Sketch by a Correspondent—is now approaching completion. 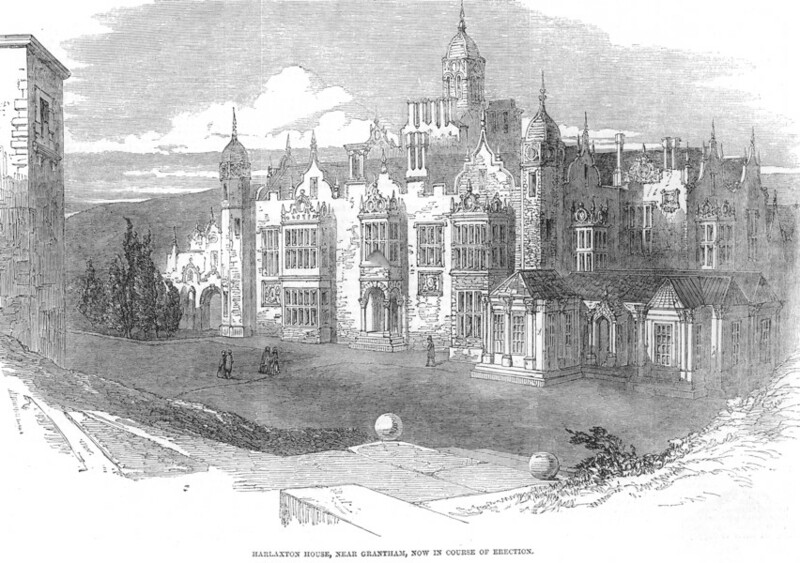 It is in the Jacobean style of architecture, and has numerous bay-windows, with pierced parapets; entrance porches, supported by columns; turrets with cupolas at the angles; and a larger tower, picturesque gables, and chimney shafts, such as characterise the "proper house" of the English gentleman. Our Cor­respondent describes the splendid edifice as rivalling in grandeur of scale and beauty of detail, Belvoir Castle, which crowns the opposite height.